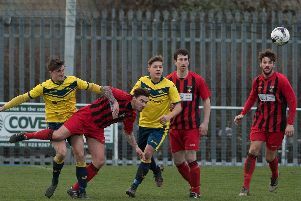 Moneyfields are facing a few travel headaches as they continue their push for the top spot in Southern League division one south with a trip to Bideford on Saturday (2.15pm). The home side have moved the kick-off forward because of problems with their floodlights. This means Dave Carter and his team will have an 8am start from Dover Road. After experiencing some nightmare journeys already this season the visitors are taking no chances. The Moneys boss said: ‘Though their floodlights are not broken Bideford have told us they are damaged. ‘There was a danger with a 3pm kick-off that we could travel all the way there to find the game was off. ‘That is why we agreed to an earlier kick-off. ‘We have not had the best of luck with some of our journeys this season. ‘Even this week the coach company we usually use has gone bust. ‘So we have had problems before we even get out of the city. ‘Going to Cinderford we were stuck on the M4 for four hours and didn't get to the ground until 15 minutes before kick-off. ‘We ended up getting well beaten on that occasion and we don't want a repeat of that. With Brett Poate expected to return from injury Carter has the luxury of a full-strength squad to choose from. They will travel with the confidence of a side unbeaten in their past nine league games. The visitors are also aiming for a fourth-straight clean sheet. Bideford have conceded nine goals in their past two games and Carter wants to see any defensive weaknesses punished. ‘We have to be far more clinical in front of goal. ‘There is no problem in creating chances we just need to make sure we stick them away. ‘I want us to come away with three points.